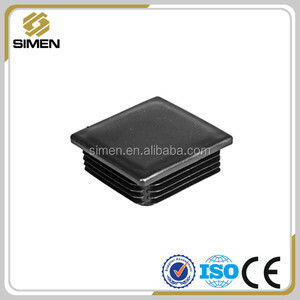 4 YRS Foshan Hereditary Hardware Products Co., Ltd.
4 YRS Shijiazhuang Yishu Metal Products Co., Ltd.
3. Start the mass production after getting your payment(deposit). 3. 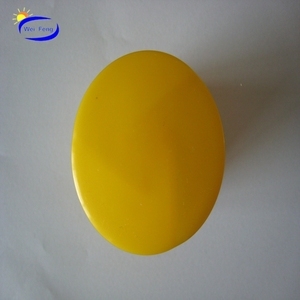 Good service, the customization and trial order are both accepted. 2. Complete production line of weld and surface treatment. 11 YRS Wei Feng (Tianjin) International Trading Co., Ltd.
2 YRS Weifang Polaris Hardware Co., Ltd.
4 YRS Qingdao Simen Industry & Trading Co., Ltd.
4 YRS Liaocheng Crown Craftsman Metal Products Co., Ltd.
2 YRS Hebei Sincerity Building Hardware Products Co., Ltd. 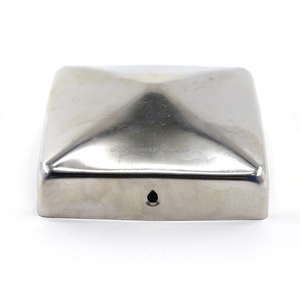 Cast Aluminium Pyramid Fence Post Caps 3.5"
11 YRS Hebei Jinshi Industrial Metal Co., Ltd.
1 YRS Hangzhou Yuxi Metal Products Co., Ltd.
13 YRS Hangzhou Saitong Import & Export Co., Ltd.
4 YRS Shijiazhuang Nolens Trading Co., Ltd.
Nolens can supply Stamped Iron ,Cast steel,Cast Iron,Forged Picket,Forged Material,Wrought Iron Ornamental, Forged Iron Balusters and Panels, solid and hallow balls , Blacksmith Tools,Wrought Iron Machine ,Finished Products ,also nails and iron wires. 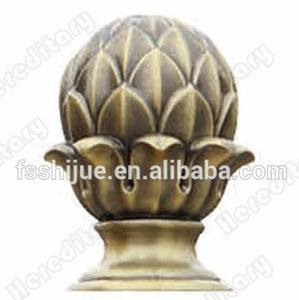 About The Cast Iron Ornaments Material Made of Cast iron,wrought iron Size(mm) To Be Ordered Surface Treatment Sand Blasted and Anti-Rust Oil/Water Feature Easy to weld and equipped with Designs,smooth Surface Usage Interior and Exterior Decorated in your home and Garden Package Carton Or Iron Case,As you required We are doing our best to meet more requests from customers' required. We hope that we can supply every customer good products with good quality and service, we have to make a progress,but we need your help,my visitors,thank you sincerely for your trusting on us and contacting us. 3 YRS Hebei Obe Metal Co., Ltd.
3 YRS Hangzhou TL Metal Co., Ltd.
7 YRS Hebei Crown Wealth Trading Co., Ltd.
4 YRS Hebei Houtuo Co., Ltd.
7 YRS Qingdao New Taosheng Metal Products Co., Ltd. Meanwhile, we have also the capacity for supplying products made from cast, forging and stamping, drop forging and welding. OEM service is offered,we can make the moulds or design the parts exactly per the samples or the drawings you supplied. Our corporation is always striving to improve our service to all old and new customers throughout the world. 1 YRS Botou Furuida Hardware Product Co., Ltd.
11 YRS Shinegolden Steel Craft Co., Ltd.
5 YRS Beijing Hongye Metal Products Co., Ltd.
5 YRS Nanpi County Daqiang Hardware Products Co., Ltd.
8 YRS Hangzhou Celia Hardware Co., Ltd.
8 YRS Dinggin Hardware(Dalian) Co., Ltd.
5 YRS Anping County Zhaoyangsheng Metal Wire Mesh Co., Ltd.
9 YRS Foshan Longbang Metal Products Co., Ltd.
3.Erosion resistance and temperature change resistance. 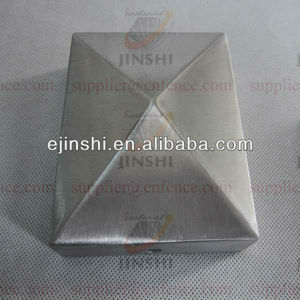 There are various steel arts flower parts to choose. Welcome to have a visit to our factory at any time. 4 YRS Jiaxing Renze Import & Export Co., Ltd.
12 YRS Zhejiang Dongrun Casting Industry Co., Ltd.
13 YRS Qingdao Benxiang Artistic Wrought Iron Co., Ltd.
15 YRS Brilliance General Equipment Co., Ltd.
&bull; Effective and strong technical support and excellent sales service. &bull; Sufficient production capacity (only 65% occupied). &bull; Efficient communication (48-hour quote lead time). 8 YRS Anping Baochuan Wire Mesh Products Co., Ltd.
Wrought iron fence cap: 1.Introduction: Wrought iron guardrail network using assembly type whole frame structure, be helpfulfor construction, installation is convenient, fast; Nets pieces and pillar used between the first party neck bolt semicircle, match with security gasket, canprevent be artificially optional down; Suitable for mass production, highway or park, usually no more than two meters high, to coordinate with the naturalenvironment. 2.Material: galvanized steel pipe 3.Size: 2.5m(W)*2m(H) 4.Specification: (1) Square post: 50*50mm (2) Horizontal pipe: 40*40mm (3) Vertical pipe: 19*19mm (4) Spacing:13cm (5) Chassis:150*150mm 5.Packaged form: It can assemble nets piece of form, or cooperate with bolts or rivets after the packaging. 6.Surface finish: plastic spraying 7.Characters: (1) for high volume, standardized production; (2)Installation fast and less labor; (3) the structure is beautiful and good harmony with the environment. 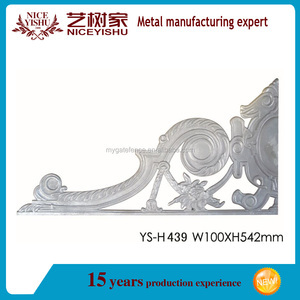 4 YRS Nanpi Huize Metal Products Co., Ltd.
Q: Can I print my logo on the products 9 A: Yes, we can print your logo on the products as you required. Q: What's the lead time9 A: It will be 1-5 days for sample and 2-12 days for bulk order, it depends on your required. Q: Can you arrange the shipment9 A: Sure, we can arrange a trustworthy shipping company the arrange the shipment for you! 4 YRS Hebei Nana Trading Co., Ltd.
1 YRS Liaocheng Terui Metal Products Co., Ltd.
2 YRS Liaocheng Crown Craftsman Metal Products Co., Ltd.
7 YRS Qingdao Ouguan Forged Iron Co., Ltd.
5 YRS Nanpi Qingyun Industry And Trade Co., Ltd. 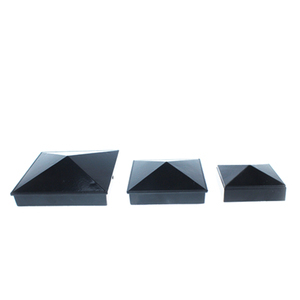 The main Product is drop wire clamp,CATV message clamp, metal junction box, stainless steel strut clamp, post cap, ang all kinds of stamping parts etc. So far,customers from many countries and regions have established long-term cooperation with us, highly appreciated the product quality and our professional service. "Quality first, customer first" is the principle of our company, we can always supply you stable high quality products with competitive prices and the best service. 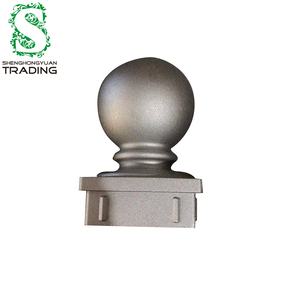 7 YRS Qingdao Hualute Machine Co., Ltd.
Alibaba.com offers 820 cast fence cap products. About 52% of these are fencing, trellis & gates, 12% are balustrades & handrails, and 1% are stainless steel balls. A wide variety of cast fence cap options are available to you, such as free samples, paid samples. 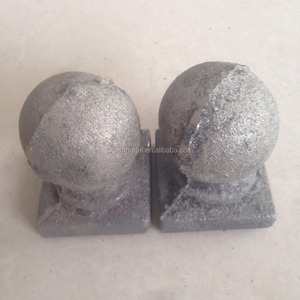 There are 820 cast fence cap suppliers, mainly located in Asia. The top supplying country is China (Mainland), which supply 100% of cast fence cap respectively. 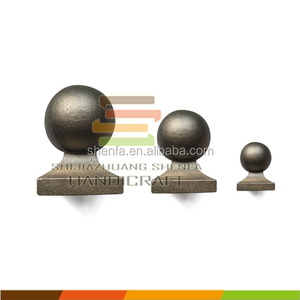 Cast fence cap products are most popular in North America, Western Europe, and Mid East. You can ensure product safety by selecting from certified suppliers, including 153 with ISO9001, 55 with Other, and 33 with ISO14001 certification.